i did a major search on Sunday for some info. I just ordered 4 mags to convert myself. I am no gunsmith, but an armorer for 15+ yrs in the Navy, and I know my way around weapons. Here is the info I found, did a copy and paste from some old site. Got a Egyptian Hakim and want more firepower? Here's the scoop in BASIC ENGLISH. STEP BY STEP. 2. 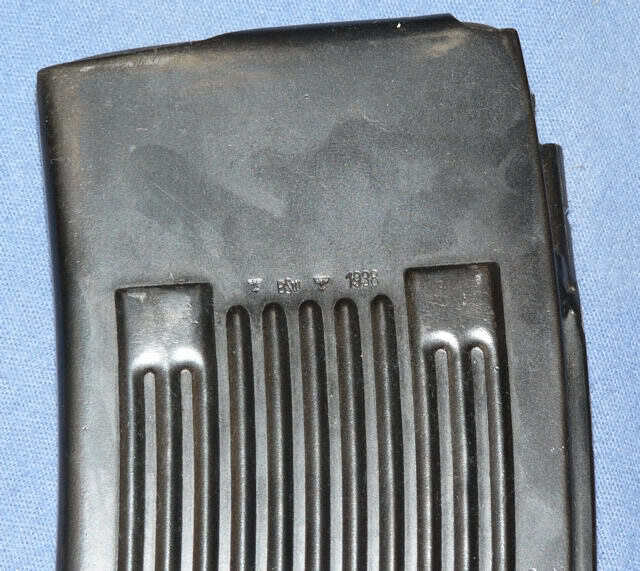 A German MG13 25rd Magazine. 3. Simple hand tools a dremel preferred. 1. Clear out your rifle . 3. Remove the triggerguard/magazine housing. Pick up your Mg13 mag. Disassemble it ,a very easy task. 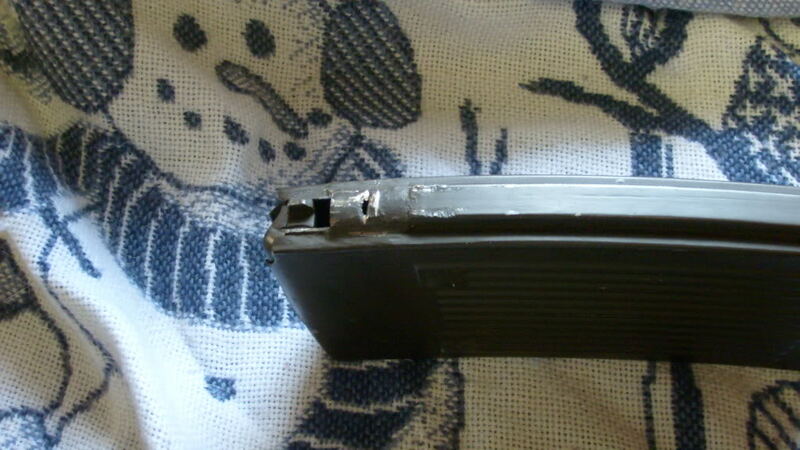 Cut off the mag lug on the front of the Mag and grind smooth. 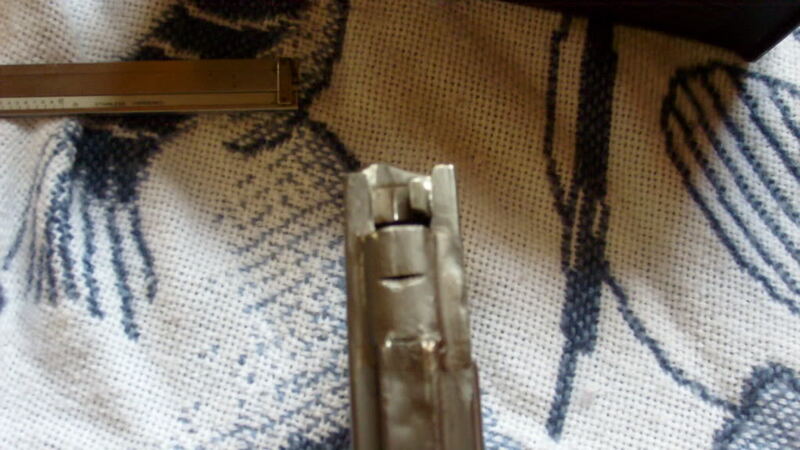 NOW attempt to insert your MG13 mag into the mag well assembly. Look at the area that covers up the "spine" of the magazine. You need to grind the portion out of the mag well untill you get a smooth fit. You don't want a sloppy or a super tight fit. When It fits into the mag well . Take it out. MEASURE Exactly 7" from the BOTTOM. You need to remove only the spine that goes over the 7" mark. catch (itself will be 1/8"). Now test it out . It should fit perfectly (expect very minor tolerances ). NOW For the MAGAZINE FOLLOWER. LOOK at it from the REAR. There's 2 "EARS" on the back . REMOVE THE LEFT ONE COMPLETELY. hold open when your'e empty. slam into it. Very Simple. Put the Rifle on SAFE and lock your bolt to the rear. Now put it on FIRE and let the bolt go forward. It should feed. the Mag lips so It's Smooth. HAND CYCLE the WHOLE MAG. Take note of which side GOOFS and adjust mag lips accordingly. I have breezed thru this and have not made any changes to it. Soon as i get my 4 mags in and end up scrapping one of them for practice. I will document and photo the second mag to repost here. Ok, time for an update, been far too long, and received various emails about the process. basically boils down to two ways to do this modification. 1. Modify the rifle by squaring the the rounded area in the magazine well area for the magazine lock to accept the the square spline of the MG-13 mag, and file a notch into the spline for the mag lock to catch in. NOTE: doing this will be a permanent modification to your rifle; May decrease the value of your rifle; May not allow the original mag to fit tight, and flop around during firing causing miss feeds/stove pipes. 2. The other means is two perform a modification to the Magazine itself. I pretty much removed a section of the spline, and added a piece of steel pipe which you can do by welding or brazing. Attached are Photo's of JB's mag which someone posted in an older post, and photo's of my modified magazine. The original post that I found was old, links did not work, but instead of basing my measurements of the base of the mag and trying to follow the curve of the spline to figure out where to cut it off. If you notice in the Photo's above, the mag stops on the sides of the magazine is where I removed the spline, from that point up. The same on JB's mag! The section of steel pipe (3/4" OD) should only be about an inche long, and should sit no higher than .200. I cut an approx 1/3rd and filed to the height. You will need to degrease/de-oil the magazine for welding/brazing and remove bluing/parkerizing on this section of pipe to the magazine. After welding brazing the section on, try to fit into magazine well, and clean up any areas of weld/braze that are interfering with mag fit. When the mag fits snuggly into the magazine well, try to engage the Magazine lock, this should slightly mark the section of pipe where to file or grind the locking notch. Then just merely follow the instructions above for modifications to mag follower and to adjust the mag lips for smooth feeding. If you are not a welder, or don't know anyone who welds or brazes, JB does have these available at a price! He appears to put them out when there is demand for these. Or you can just make them yourself! Maybe someday, I will smoothen all this out, with better photo's for submission as an article?! Hope someone will find this info useful.